President Obama Commutes Chelsea Manning’s Sentence! The Chelsea Manning Support Network applauds this decision by outgoing President Barack Obama, and extends our heartfelt gratitude. A commutation can not be reversed by a future president. 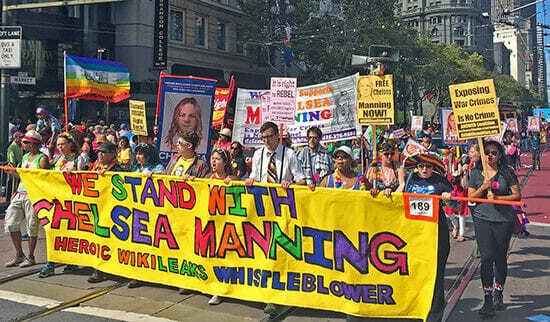 The Chelsea Manning Support Network was founded in the weeks following Chelsea’s arrest in Iraq in May 2010. The Network covered 100% of the legal fees associated with her pretrial hearing, court martial trial, and raised a significant amount toward the legal costs of her appeal. Many days during her trial, the courtroom was packed with supporters wearing “truth” shirts. “Over the last few years, I’ve come to know Chelsea as a deeply intelligent, sensitive woman who doesn’t deserve to spend decades in prison. I often feared that any more time behind bars would be devastating for Chelsea, or potentially even lethal, especially with President-Elect Trump taking office. Soon, she’ll have a chance to live the life she’s been denied for almost seven years,” Rainey Reitman, co-founder of the Chelsea Manning Support Network. In addition to fundraising, the organization worked to raise awareness of Chelsea’s case. The Support Network held hundreds of rallies around the world, from San Francisco and London. Chelsea’s supporters became regular participants in yearly pride parades the last several years. In addition, the Support Network placed billboards in Los Angeles and Kansas City, ran a full-page New York Times ad, and helped generate over one million petition signatures in support of Chelsea’s release. “In conversations Chelsea and I had while she was imprisoned, I learned that she’s not only driven by principles, but that she believes in the foundations of America’s government. She dreamed about attending graduate school, and helping to research ways that government could use technology to improve transparency and public participation. Whatever she chooses to do now, the world is better for having a bright young person free to pursue a meaningful life,” noted former campaign manager Emma Cape. A world without a conscience isn’t likely to last very long. Try to stay in business, fellas. Sometimes I am very proud of our country and our President/Presidents, and today is one of those days. Congrats Chelsea Manning! I am really happy. Congratulations to Chelsea for standing strong and to her supporter network for never giving up. Amidst the manufactured chatter and propaganda, it’s reassuring to know that people are fighting for truth and justice, and being seen.